A virtual private cloud (VPC) configured with two subnets, one public and the other private. A network address translation (NAT) instance deployed into the public subnet and configured with an Elastic IP address for outbound internet connectivity and inbound SSH (Secure Shell) access. A Microsoft Windows Server instance deployed in the public subnet for downloading SAP HANA media and for providing a remote desktop connection to the SAP Business One client instance. A SUSE Linux Enterprise Server (SLES) instance deployed in the private subnet for SAP Business One, version for SAP HANA. A Microsoft Windows Server instance deployed in the private subnet for the SAP Business One client. 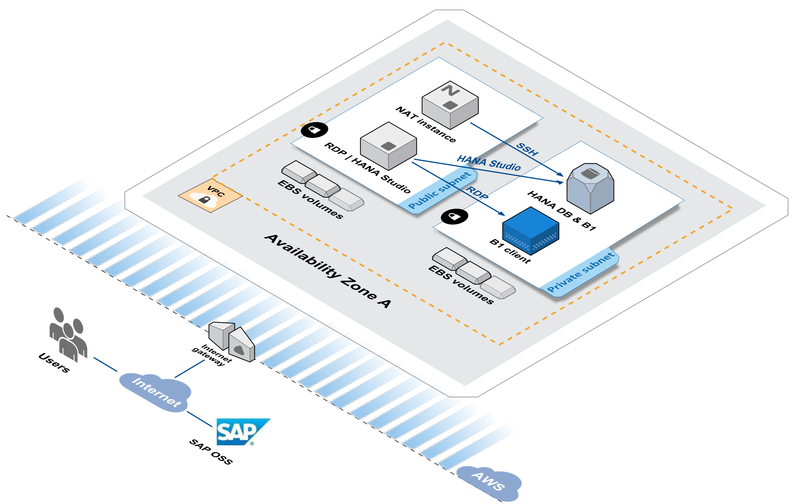 A SAP HANA system installed with Amazon EBS based on General Purpose (SSD) volumes configured to meet performance requirements for SAP HANA. SAP Business One, version for SAP HANA, server components installed on the SAP HANA database instance. SAP Business One, version for SAP HANA, client components installed on the Microsoft Windows Server instance. This Quick Start supports the EC2 instance types listed in the following tables. These are customizable during deployment. The following EC2 instances are certified by SAP to run SAP Business One, version for SAP HANA, on the AWS Cloud platform for production use. For details, see SAP Note 2058870 (SAP Support Portal access required). Additionally, for non-production usage scenarios, you may choose any of the following EC2 instance types for your deployment. The installation of the SAP HANA database software and SAP Business One software by this Quick Start follows best practices established by SAP for implementing SAP Business One, version for SAP HANA. The following table shows the components installed by this Quick Start in different layers.